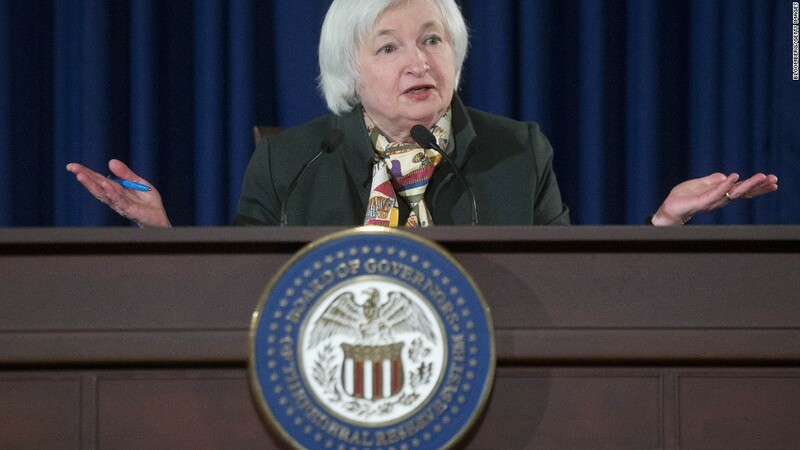 When is an interest rate hike coming? Investors look set to farewell April on a downbeat note. U.S. stock futures are slipping early Thursday, matching declines across international markets. 1. Earnings and economics: Earnings season continues in full swing with Time Warner Cable (TWC) and Exxon Mobil (XOM) reporting ahead of the open. Expedia (EXPE), LinkedIn (LNKD) and Visa (V) will report after the close. On the economic front, the U.S. government posts weekly jobless claims at 8:30 a.m. ET. It will also report personal income and spending numbers at 8:30 a.m. ET. 2. Oil climbs: Crude futures ticked up 1% in electronic trading to hover just above $59 a barrel. Oil is trading at its highest level this year, helped along by a weaker than expected U.S. supply report on Wednesday. 3. International markets: European markets are heading south in early trading, with France's CAC index down 0.8%. Shares in oil giant Shell (RDSA) rose 1.7% in London after its first quarter profit result beat analysts expectations. Telecoms equipment maker Nokia (NOK) disappointed investors with its first quarter earnings -- the stock tanked 9%. Asian markets ended the session lower. Japan's Nikkei tumbled 2.7% after the central bank left its policy unchanged. 4. Wednesday market recap: It was a soggy session across U.S. markets, with the Dow Jones industrial average losing 75 points, while the S&P 500 fell 0.4% and the Nasdaq closed 0.6% lower. Still, major U.S. indexes are on track for slim gains for April.